Thanks to recent improvements, many patients who previously could not wear contacts can now wear them successfully. 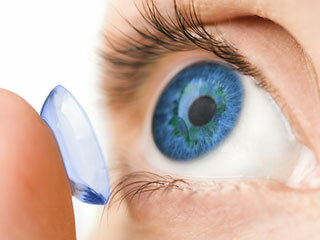 Each doctor here at Carlson-Tillisch Eye Clinic has a great deal of experience when it comes to contact lenses. Let us help you find the perfect contact lenses for you! We utilize the latest contact lens technology to ensure your contact lenses are comfortable. Whether you need single vision, bifocal, or astigmatism correcting contact lenses, our experienced doctors and staff will go the extra mile to make your experience extraordinary. Our eyecare professionals provide the information and training you need for a healthy and comfortable contact lens experience. How do I know if I can wear contacts? Choosing contacts is about vision correction, comfort and lifestyle. We have patients from age 8 to 80 wearing contact lenses with clear, comfortable vision. If you want to reduce your dependency on glasses or have been told in the past that you cannot wear contacts, check us out - we may be able to help. A good contact lens fitting starts with an eye exam. The doctors will choose your contacts based on your prescrition, eye shape or any special conditions. Ask your doctor which contact lenses are best for you. Wearing Period - daily wear or continuous wear lenses for overnight use. Replacement Schedule - single use, weekly, bi-weekly, monthly, quarterly or yearly replacement. Type of Vision Correction Required - Spherical (myopia or hyperopia), Toric (astigmatism), or Multifocals (presbyopia). Soft lenses are the most common type of contact lens. They are generally larger and more comfortable than gas permeable lenses. Prescribing the right lens for you requires skill. For example, some lenses work better for dry eyes and others for astigmatism. RGP contacts are generally the safest contacts to wear but they often take more time to fit. They cause fewer infections and provide the most oxygen to the eyes. With proper care these lenses can last for years. Patients who have problems like keratoconus, post refractive surgery corneal ectasia, or irregular astigmatism may be fit with a lens like the Synergeyes hybrid contact lens. These contacts can provide the crisp vision of an RGP with the comfort of a soft contact. Each lens has its advantages, so speak with one of our doctors today to learn more about the myriad contact lens options available.